There is a long established history of applying Artificial Neural Networks (ANNs) to financial data sets. In this paper, the authors demonstrate the use of this methodology to develop a financially viable, short-term trading system. When developing short-term systems, the authors typically site the neural network within an already existing non-neural trading system. This paper briefly reviews an existing medium-term long-only trading system, and then works through the Vanstone and Finnie methodology to create a short-term focused ANN which will enhance this trading strategy. The initial trading strategy and the ANN enhanced trading strategy are comprehensively benchmarked both in-sample and out-of-sample, and the superiority of the resulting ANN enhanced system is demonstrated. Vanstone, B. J., Finnie, G., & Hahn, T. (2009). 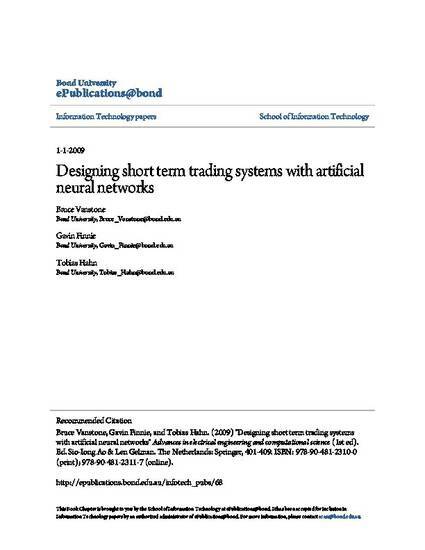 Designing short term trading systems with artificial neural networks. In S. Ao, & L. Gelman (Eds.). Advances in Electrical Engineering and Computational Science (pp. 401-409). The Netherlands: Springer Netherlands.